Halloween is my favorite! I love pumpkins and trik-R-tweet! 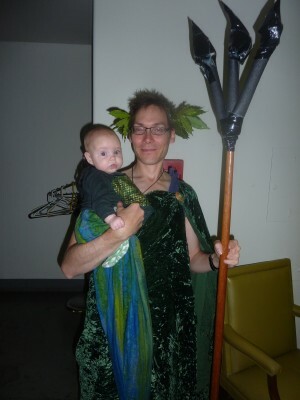 I had two Halloween costumes this year! I was a science officer from some science show from way back in the 60s called “Star Trek”. We had a big party where mommy and Aunt Beth and Aunt Darcy painted themselves green and everyone danced. Eirene and I got to run around and eat cookies and we even drank out of a big bucket! 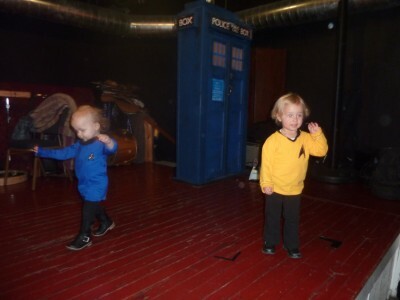 Here is Eirene and I dancing onstage next to a huge blue thing called a TARDIS that daddy built. Eirene was a Star Trek officer too. Our friend Juniper was there as well, but she was a mermaid and mermaids can’t dance outside the water, so her daddy had to carry her everywhere. I was sad: I think her mommy and daddy forgot to bring enough water for her.